Olga Chernysheva (Russia), Georgy Ostretsov (Russia), Claudia Kappenberg (Germany), Radek group (Russia), Superflex - FACT collaboration (Denmark - UK). Installation devised in response to three original stained-glass panels in the east window of St Peter's church. The stained-glass windows were designed by Edward Coley Burne-Jones in 1880, and are depicting The Woman of Samaria at the Well, a story of reconciliation. St Peter's church was designed by James Gibbs in 1724. The installation uses video footage of an earlier performance in Geneva. 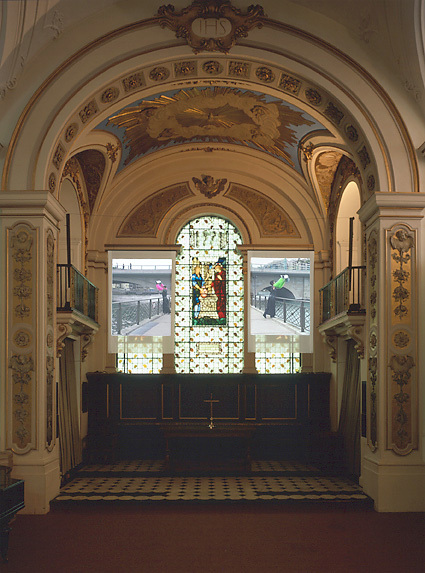 In the context of St Peters church the work echoes the motif of collecting water that is displayed in the stained-glass windows, but suggests an impossible goal: two women performers endeavour to scoop water from one side of the bridge and pour it into the other whilst working in opposition to each other. The ritual both enacts and abstracts the adjacent biblical scene and transfigures a singular instance through a doubling and endless repetition. As in previous works of mine the installation performs repetition, the impossible and the absurd. Choreographies disturb one pattern by performing another, challenge one system by creating another. The recycling of water, far from being a restriction, turns into excess that both mirrors and disturbs the everyday. In its impossibility to achieve anything the work becomes a form of play. Each bucket is like a question asked but not answered. Each passage is a new beginning and another ending. With each pause the synchronisation of the performers is emphasised and the rules of the game asserted. The impossibility of the task at hand does however not stop the activity. Strangely it becomes its motor. There is neither dystopia nor utopia in this work but it is a work after all, and a play. In the end it is the kind of work art can do. Apart from recycling water, the performance also recycles costumes that belong to another performance group, The Five Andrews. Chosen for their black rubber skirts and fluorescent sleeves the costumes appear at first appropriate and useful. However they go beyond a probable work wear to introduce a visuality that shifts the work sideways to becoming a piece of theatre or dance.